As requested by a good friend, I made this dish, and here is the recipe. 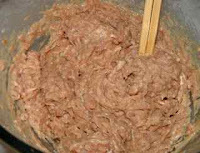 For this recipe, Northeast people normally use pork mince, but in my ethnic group (see here), people normally use beef mince. We had a friend over the day I cooked this and she just recently turned into ‘half-vegetarian’, so I modified this meat mince, used meat free mince for her plate. So if you are vegetarian, this is your option. 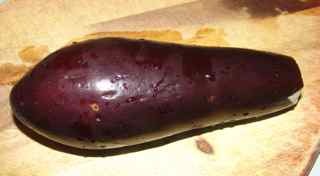 The dish is actually not that complicated at all, just half slice pieces aubergine, then stuff the prepared beef mince in it, and use flour paste to ‘block’ the mince from leaking out, then oil fry the whole thing. easy? :)) — Here are the steps. 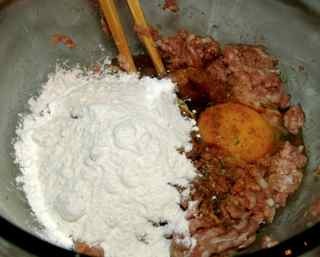 Beef mince (or pork mince, or meat free mince for your choice), oil, eggs, flour, cooking wine, light soy sauce, salt, five spice powder, sesame oil (optional). In a bowl of beef mince, mix in one egg, 1 cup of flour (or corn flour), 1 tablespoon of cooking wine, 2 tablespoons of light soy sauce, I teaspoon of salt, 2 tablespoon of sesame oil (optional), 1 teaspoon of five spice powder, and around 4 tablespoons of oil (if you are using meet free mince, you need to put a bit more oil). Mix two cups of plain flour (or corn flour), one egg, water, a small pinch of salt, a few drops of light soy sauce into a nice thin paste, but not ‘waterish’. 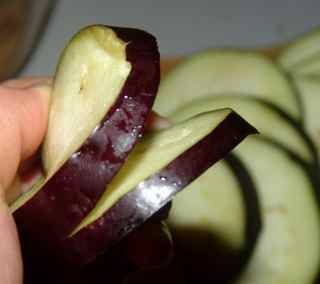 1) Slice the aubergine across into about (not more than) 1cm thick pieces. 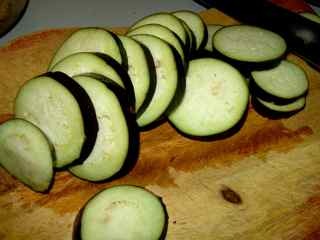 Then slice every piece from the middle, but not slice through, keep one end still connected. 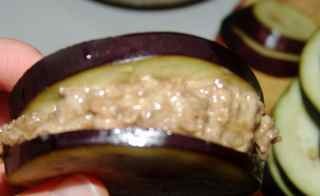 Stuff prepared the mince into half sliced aubergine, slightly press the aubergine, make the mince flatly, evenly placed in the aubergine. 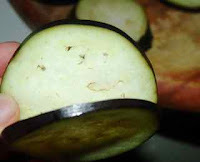 The shape of the aubergine is still ‘flat’, not raising too much. 1) In a sauce pan ( I use a flat sauce pan for this kind of frying, coz I prefer shallow fry, it is normally done in a wok for deep frying). 2) Dip ‘stuffed’ aubergine pieces into the flour paste, pay attention to the bit where the mince is exposed — use the paste to prevent the mince from ‘leaking’ out. 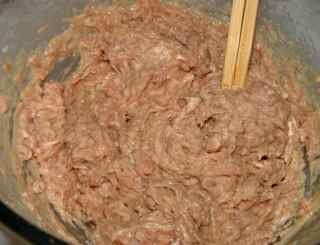 (Some people would use the paste only on the part where the mince is exposed — it is the same. 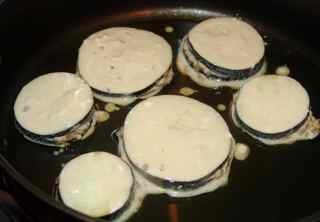 But since I like the crispy surface, and don’t like it when the aubergine absorbs lots of oil, I wrap the flour all around the aubergine). 3) Turn around the aubergine pieces time to time, until both sides turn into slightly golden colour and crispy – it is ready for serving! It is slightly heavy, good to go with boiled rice or beer. 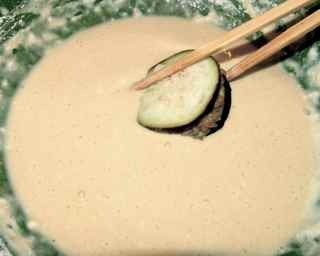 If you like, you can also prepare a little mix of salt and white pepper on the side, dip ‘qie he’ in, and just enjoy! 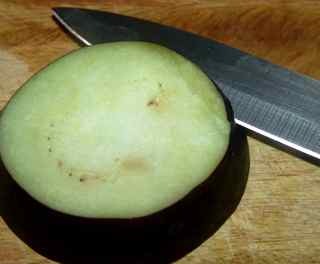 :)) But you need to eat it soon after it is cooked, otherwise it will loose the crispiness. >Oh goodness, Shibin, this looks wonderful!